It was also fastidious in its personal habits. When it had been confined to the hut, it had figured out that by going into one of the ventilated tubes to piddle, it would not wet its own floor but mine instead. It could spend twenty minutes grooming, too. This consisted of sticking a hind leg in its mouth and then flicking the leg as fast as a humming bird's wing over its fur. Then doing the other side. Then repeating this sequence about twenty or thirty times. Sometimes it put its forepaws in its mouth and then batted at its ears, brushing the fur forward. Grooming seemed to be an act of obsessive nervousness rather than true fastidiousness since it often performed the operation while sitting in a dung pile. 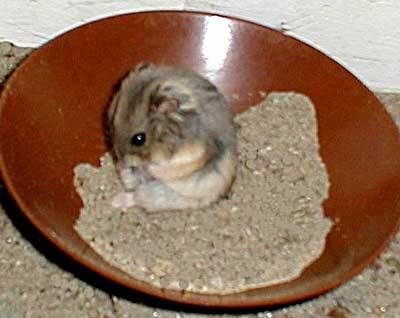 Although the hamster could roam freely in its run, I had hoped it would settle in its Country Club hamster hut and had fixed with up with fresh shredded paper towels on the floor and enticing piles of seeds. Instead, it spent its nights dragging the paper towels out of the hut and into a corner and then chewing them to the right density. By day I gathered the shredded towels and returned them to the hut, and by night it dragged them out again. The hamster outlasted me. I thought that the hut was not dark enough and I draped a soft black rag over it. The hamster went into a frenzy when it saw the rag. It jumped up on its hind legs and tried to claw the cloth down. It grabbed a corner in its teeth and yanked. I finally tore off short strips of the soft rag and dropped them into the run. 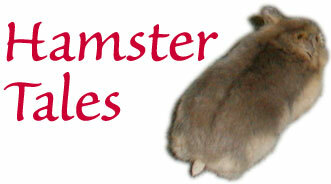 The hamster ran off with them as if pulling off a bank heist. Ted watched and said, "You know, it's really fussy about its food. It's fussy about its decor. And it can't stand anyone. I think you should call it Francois."